One day in early February, Kiku and Miko decided it was time to pay Boss Panda a visit. They took the Setagaya line from Sangen-jaya (two stops west of Shibuya station) to the Nishi Taishido area of Tokyo, a residential district with a few old bathhouses. 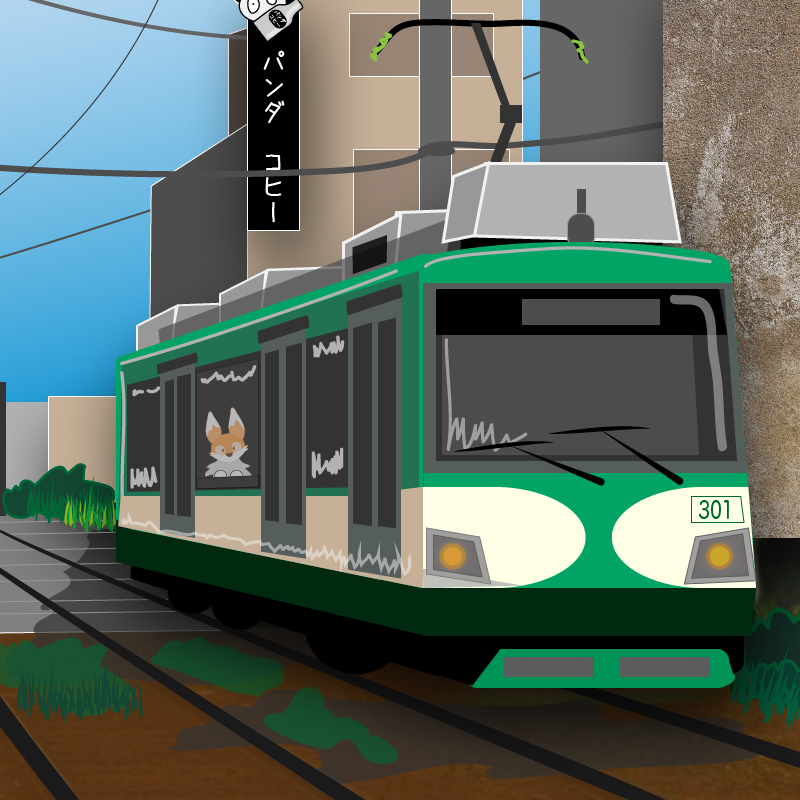 The Tokyu Setagaya-sen (東急世田谷線) is a private light rail line that runs for just 5km and has ten stations. There are only two such tramlines left in Tokyo. Along the short route there are quite a few interesting sights and shrines to see, and a One Day Free Pass costs 320¥. Following the instructions given to them by Mama Kojin at the Shozoku shrine, Kiku and Miko arrived at the entrance to the Bamboo Bathhouse on the cold February day. The sento had a tiled roof entrance, with a tall chimney rising up somewhere from the back of the building. 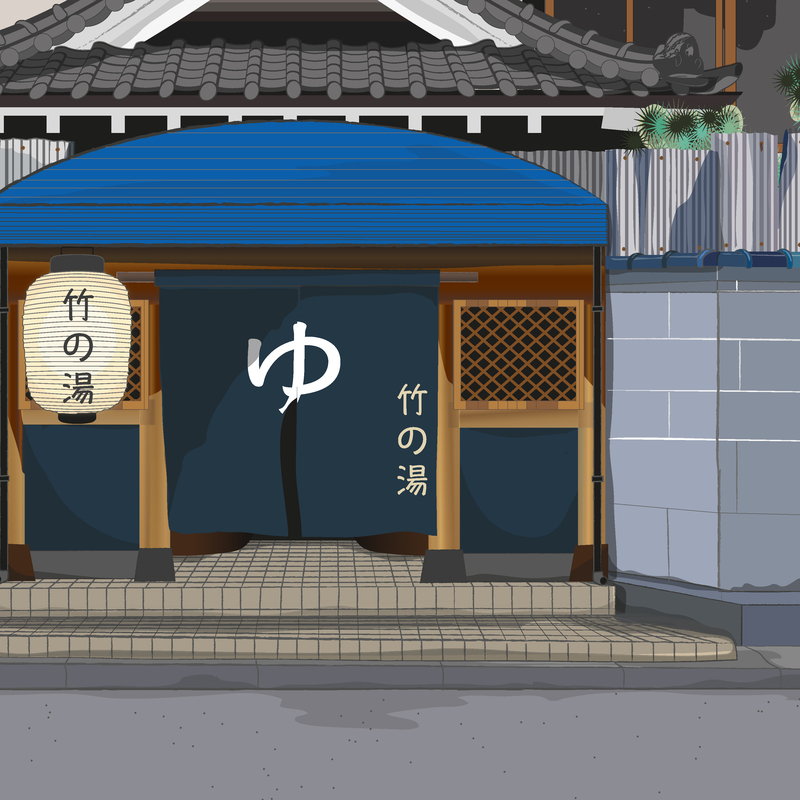 There was a blue noren split curtain over the entrance with the ‘ゆ’ character on it – which means ‘hot water’. 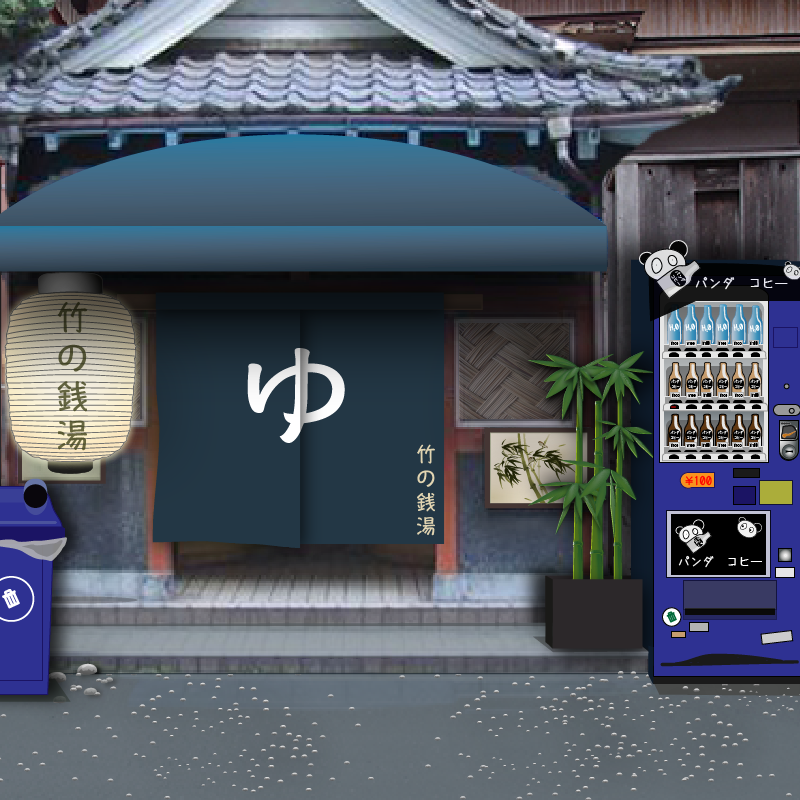 A large lantern glowed softly to one side, and a vending machine stood on the other, lit brightly from within. Inside, a little old lady who appeared to be playing chess with a rather scruffy looking black crow waved them through. They passed rows of lockers and a long wooden rack with baskets. Ahead was a partition, with two entrances – one for males and one for females. Kiku realised he would have to go it alone from here. He turned to Miko and said “You go and get a drink from the vending machine – I will shout if I need you.” She looked unsure, but nodded, and patted him for luck. As Boss Panda began to rise out of the water, Kiku realised just how big the bear was, and wondered whether he should run and find Miko. 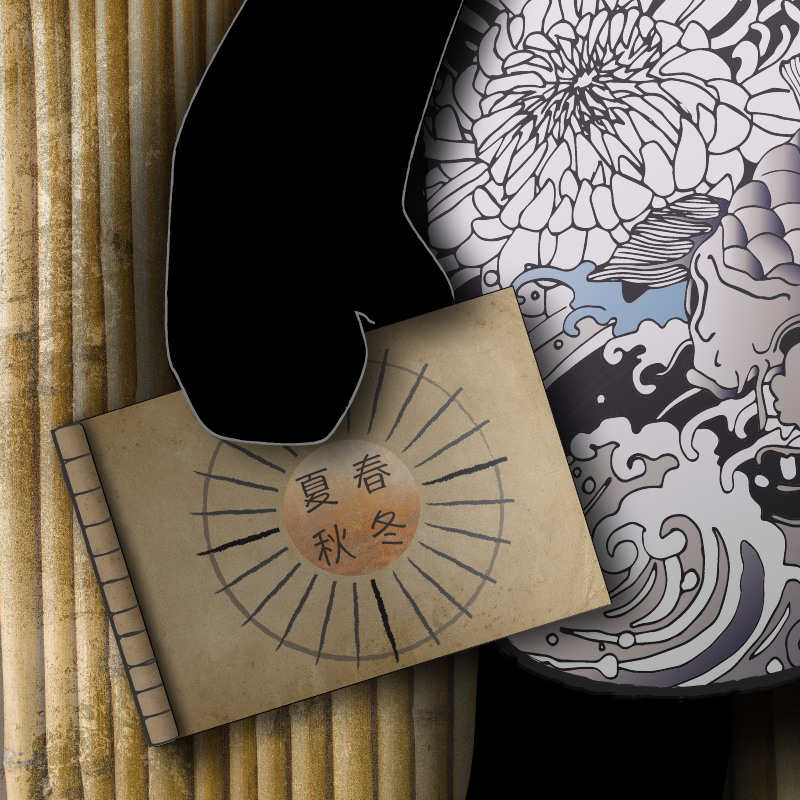 As Mama Kojin had said, his torso was covered in large monochrome tattoos depicting crashing waves, a carp and flowers. Kiku stayed rooted to the spot and tried not to stare. “Mama Kojin advised me to follow the local traditions and seasons, in order to discover a path for myself…” Kiku said bravely, “and my friend Miko-chan,” he quickly added. 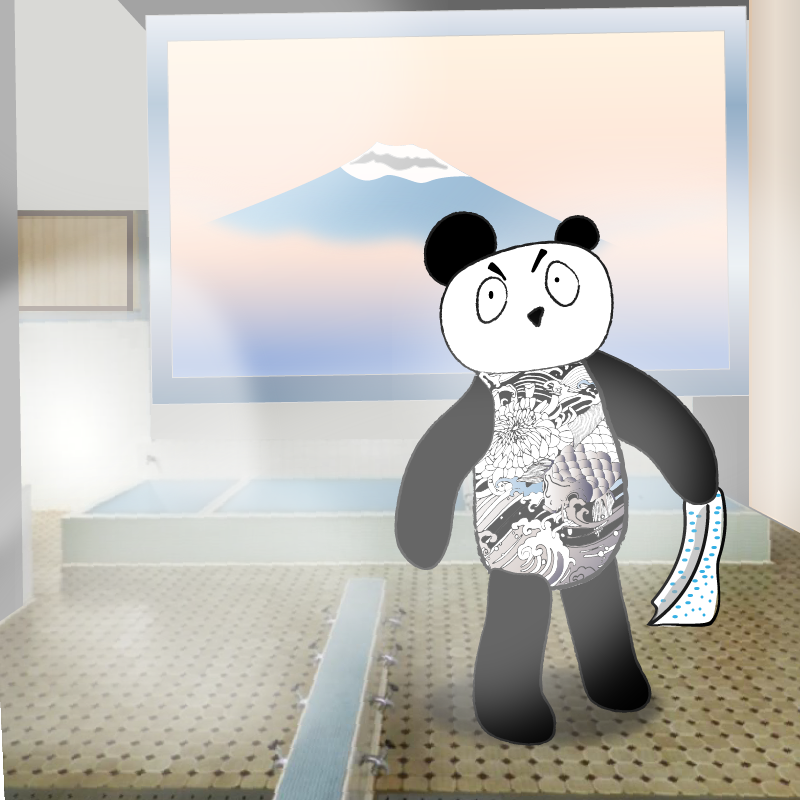 The massive bear lead Kiku to a small office at the back of the bathhouse. The office was a cosy little space, with bamboo lined walls and an enormous massage chair. “Hmmm, we will see. Now, I need to get back to my bath, little fox”, and they walked back to the steamy tub room. Kiku thanked Boss Panda for his help and hurried to look for Miko, who he knew would be worried. He found her drinking hot chocolate out on the front step of the sento. “Well?’ she asked, checking him over to see that he had not come to any harm. Kiku explained that they now had a place to stay and some studying to do. Miko was very relieved, but also a little scared at the thought of living in the same building as the panda. “You know, he’s not so scary as he looks…” Kiku said softly, as they watched the sun set over Tokyo. Miko leant on his shoulder, and hoped he was right.